They say ‘what you don’t know can’t hurt you’. Unfortunately that’s not true when it comes to tax, HMRC always assume that you know the rules. 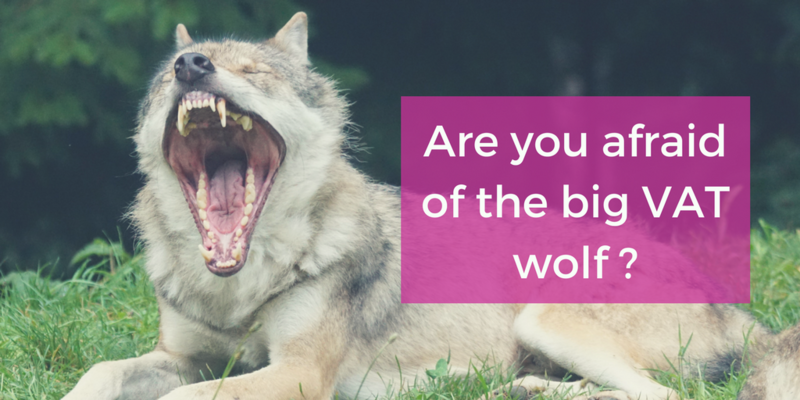 For many businesses, lack of knowledge about VAT can be a real ‘big bad wolf’. Knowing the VAT basics can keep you out of trouble with HMRC. It will also help you make a decision on whether VAT registration is an advantage or a necessity for your business. This blog post will cover the VAT basics, the top ten VAT issues to make sure you’ve got the key facts that you need to get started. Then next time we’ll move into some of the more complex VAT issues that might apply for your business. VAT stands for value added tax. It’s a consumption tax that’s added onto the value of goods or services that you sell or buy in the UK and in the EU. In the UK you can reach quite a high level of sales before you have to become VAT registered. In many countries the level is much lower or even nil, meaning that you have to apply VAT as soon as you start out in business. 2 Who needs to register for VAT? Anyone can register for VAT voluntarily but registration is compulsory if your sales turnover goes over the VAT threshold, currently £85,000 for 2016/17. The VAT threshold is based on turnover, not profit. It can be surprisingly easy to hit the threshold if you work in industries which require large amounts of purchases such as hospitality or construction. Turnover is based on gross sales. This can be important if you make online sales where commission or fees are taken off before you receive the money. Your turnover is based on the sales before any deduction, not the money that you actually receive. Turnover is judged on a rolling 12 month basis not your last set of accounts. This means you might have to register for VAT in the middle of your financial year if your sales are gradually increasing. It’s not about making a once per year judgement. It’s something that needs to be considered each month. You are supposed to register for VAT within a month of going over the threshold or if you know your sales for a single month will be over the threshold. It doesn’t matter what your profit is; even if the business is making a loss overall, once you hit the threshold you still have to register. The threshold is not fixed. It’s one of the things that the government can choose to vary, so listen out at budget time for any updates. It usually goes up slightly each year. 3 How do you register? If you have an accountant, they can register for you. You can also register yourself via your Government Gateway account. In order to register you’ll need to give your turnover, you’ll select a code to describe your business activity and you’ll also need your bank details. If your accountant is registering for you they will need all of this information. If you are registering voluntarily then you can choose your “effective registration date”, the date when your VAT registration starts. Otherwise your effective registration date is the date that you crossed the VAT threshold. As your register you can choose your VAT quarters. VAT is usually submitted and paid quarterly (every 3 months) but you can decide which quarters you want e.g. Jan, April, July, October or maybe Feb, May, August, November. Many businesses select quarters that coincide with their business year end month as it can make the annual accounts a little easier. Once you’ve registered you should receive your VAT number and VAT registration certificate around 2 weeks later. 4 What you need to do? Once you are registered for VAT you have some extra obligations. You must add VAT to your sales invoices and charge the right amount of VAT for the type of good or services your are selling. You have to keep VAT records, submit a VAT return to HMRC (usually quarterly) and pay over any VAT due. Most items have 20% VAT but there are exceptions. You have to add VAT to your sales from the date of your VAT registration even if you are still waiting for your VAT number. Once you have a VAT number this has to be shown on all your invoices along with a breakdown of the net amount (without VAT), VAT and gross amount (including VAT). You might have to reissue any invoices issued in the period between registration and receiving your VAT number. Standard VAT is calculated by adding 20% to your sale price e.g if the sale price before VAT is £100 then the VAT will be £20 and the price with VAT will be £120. VAT assumes that you can increase your prices by 20%, but what if you can’t do that? What happens if you charge a fixed price that can’t be increased? In this case the VAT element will be 1a sixth of the sales price e.g. if you sell at £100 including VAT then the VAT is £16.67. What was a sale for £100 before VAT registration, suddenly becomes a sale of £83.33 afterwards. 5 How do I work out what VAT is due? For a standard VAT return you add up all the VAT from your sales in that quarter (output VAT), add up all your VAT from your purchases and expenses in that quarter (input VAT) and then deduct the purchases VAT from the sales VAT. The VAT due to HMRC is the difference between the sales VAT (output VAT) and the purchases VAT (input VAT). If your purchase VAT (input VAT) is more than your sales VAT (output VAT) then you will be due a refund. That’s the basic VAT calculation, but then there are some alternative options to choose from when you register, such as cash accounting and flat rate VAT. Discussing the detailed pro’s and con’s of each alternative scheme is out of scope of this article; but it’s something to discuss with your accountant before you register. 6 What is Cash Accounting for VAT? When you register for VAT you’ll be asked whether you want to use the cash accounting scheme. Usually VAT works on an accruals basis, the date for VAT is the date shown on the sales invoice or purchase invoice, regardless of whether or not it was paid at that date. You would have to include sales at the point that they were invoiced even if they weren’t paid. Cash accounting means that you include sales and purchases at the date the money is received or paid. 7 What is the Flat Rate VAT scheme? Another option is the flat rate VAT scheme which is just based on sales. You still add 20% VAT to your sales invoices as usual, but then instead of deducting purchase VAT from sales VAT, you just pay a fixed percentage of your gross sales over HMRC each quarter. The percentage is based on the industry sector and is supposed to represent the average amount of vat-able expenses for that industry. The flat rate for a pub is 6.5%. If sales for the quarter were £20,000 including VAT, then the VAT due would be £1,300. VAT on expenses doesn’t get included at all apart from some large asset purchases over £2,000. This method saves time and cost on bookkeeping during the year and can sometimes work out more profitably. However, there is a new complication with the introduction of the limited cost trader definition this year. If your goods (broadly materials and purchases for sale) are less than £1,000 or 2% of your sales turnover then your flat rate has to be 16.5%. The flat rate scheme and cash accounting are not mutually exclusive. If you decide to use the flat rate scheme, you can then decide whether or not to apply cash accounting. There are other schemes such as the VAT Annual Accounting Scheme, VAT Margin Schemes (mainly for second hand goods), and the VAT Retail Schemes (for retail businesses) but again these are more complicated and out of scope. 8 When do I have to pay? The VAT return is normally due quarterly (every three months). At the end of each quarter, you have a calendar month plus 7 days to submit your VAT return and pay your VAT. For the quarter ending 31 March the VAT is due 7 May. HMRC prefer you to set up a direct debit that will take the VAT due automatically on the due date once your return is submitted. However you can pay via a bank transfer or through other methods. 9 Why it might be good to be VAT registered? You’re probably thinking, what a load of hassle, why would anyone possibly choose to be VAT registered? But there can be advantages. It largely depends on who your customers are. If your customers are mainly VAT registered businesses then they may well expect you to be VAT registered even if you’re below the threshold. If you’re not VAT registered, they can’t claim back any VAT on your invoices which might be seen as a disadvantage. It can also help the company to look larger and more professional. Some larger companies will avoid dealing with non VAT registered companies. If you’re expecting the company to grow quite quickly over the threshold then it may well be better to register straightaway. That way you can avoid suddenly adding 20% to your prices and you don’t have the continual worry about whether you have crossed the threshold. If you have a lot of purchases that include VAT then it could be worth registering as you can offset this VAT against your sales VAT. 10 Why might it be bad to register for VAT? If your customers are mainly consumers and other small non VAT registered businesses then being VAT registered can be a disadvantage. It means that your prices will be 20% more expensive than your non VAT registered competitors. Or if you can’t change your prices then you will be losing a sixth of your sales income to VAT, so your profit will be lower. VAT registration also comes with a higher workload and can often end up costing more in time or in accountancy fees. There’s no doubt that VAT is a big subject, but it need not be a big bad wolf if you can get to grips with the basics. The most important thing, if you aren’t currently VAT registered, is to know the current VAT threshold and to know your sales turnover. Once you get near the VAT threshold you need to look at this each month, it can’t just be a yearly activity. The next article will cover de-registering, what to do if you cross the threshold accidentally, what to do if you cross the threshold on a one-off event and some hints and tips to make the whole VAT process run more smoothly for you. If it’s EU VAT that you’re interested in then you might want to take a look at this article – Help, I don’t understand EU VAT!